Faith Presbyterian Church (FPC) began in 1936 when 200 people left First and Central Presbyterian Church in downtown Wilmington because of the religious liberalism that had permeated the Presbyterian Church USA. The new church wasformed as the First Independent Church of Wilmington. The new church's pastor was Dr. Harold S. Laird, the founding group's former pastor at First and Central. Dr. Laird had been removed from ministry in the Presbyterian Church USA by the New Castle Presbytery for his orthodoxy and his support for evangelical missionaries not connected with the PC USA. 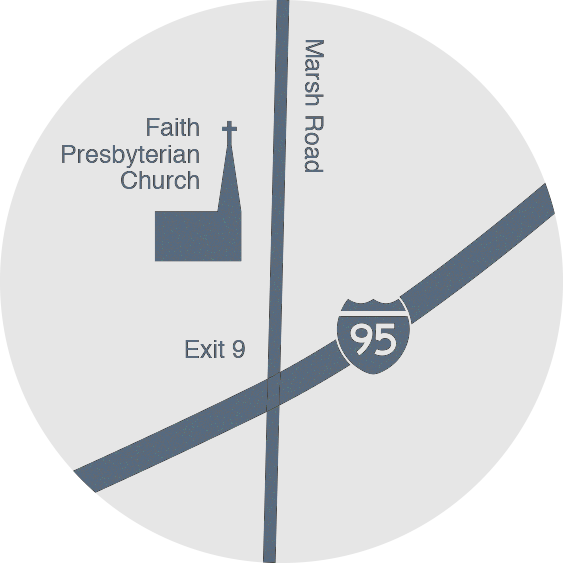 Faith joined the Bible Presbyterian Church in 1951 and took the name Faith Bible Presbyterian Church. At that time its Senior Pastor was the Rev. Kenneth A. Horner, Jr., the successor to Dr. Laird. Until 1962 the church met at 14th and DuPont Streets in a former Methodist Church building that the congregation had purchased shortly after it was formed. This building in Trolley Square has been demolished. A small strip shopping center now occupies the site. The Faith Congregation dedicated the current sanctuary on January 31, 1964, the property having been purchased in 1959. Construction began in September of 1962 and was completed in December of 1963. The first service in the new building was held on Christmas Eve 1963. Faith joined the Evangelical Presbyterian Church in 1957, the Reformed Presbyterian Church Evangelical Synod in 1965, and that whole denomination joined the Presbyterian Church in America in 1982. During these years FPC had two Senior Pastors, the Reverend Dan Cannon and the Reverend Frank Smick. In 1987 Pastor Brown was elected Senior Pastor. In June of 2012, Pastor Kevin Koslowsky was elected by the congregation to be FPC's sixth Senior Pastor. Between October of 2003 and the end of 2006 Faith went through a building program. 15,000 square feet of new space was built and all existing space, except for the sanctuary, was gutted and rebuilt. This project included the original 1963 space, and the gymnasium, office, and classroom space built in 1978. The rebuilt space was air conditioned, and built to the latest handicapped, environmental, and fire code standards. The Sanctuary renovations of November 2011 through May 2012 included a new roof, new air conditioning units, a rebuilt chancel, new audio/visual equipment, removal of asbestos tile and the installation of a terrazzo floor, the complete painting of the sanctuary, double glazed replacement windows, and new furnishings. We are absolutely astounded by God's provision for us over the years and for his incredible grace displayed.